In their first major show of resentment and anguish over current fiasco on online retail business, the offline traders across the Country staged series of Dharna today at more than 150 cities in different states of the Country led by a Dharna at Jantar Mantar at New Delhi. The series of Dharna was held under the umbrella of the Confederation of All India Traders (CAIT) demanding investigation into business modules of online retail platforms and their pricing mechanism and formation of a regulatory authority to regulate and monitor all sorts of retail trade in India. The Dharna, held in the wake of unrealistic discounts offered by online retailers in the just-concluded Diwali festival was held in Mumbai, Chennai, Hyderabad, Bangalore, Calicut, Cochin, Kolkata Chandigarh, Lucknow, Nagpur, Baroda, Kanpur, Dehradoon, among other places. In Delhi, beside large number of other organizations’, the Dharna was prominently joined by Delhi Mobile Dealers Association, Delhi Computer Dealers Association, All India Distributors Association, Consumer Electronics Traders Association, Book Publishers Association etc. Addressing protestors at New Delhi, CAIT Secretary General Mr. Praveen Khandelwal said that business of offline retail was down by at least 45% because of the predatory pricing mechanism and non-transparent & unchecked business practices adopted by e-retailers. There has to be a law for conducting any format of trade in the County and therefore like US, UK, China & European Countries where they have established Rules & Regulations for e-retail, India too must have specific Act, Rules & Regulations for E Commerce business in India-said Khandelwal. In USA, E Commerce business is regulated through Federal Trade Commission and in UK, the E Commerce business is regulated through Electronic Commerce (E C Directive) Regulations, 2002 whereas in European Union it is regulated via EU Electronic Commerce Directive. In such a situation, the Government must immediately formulate Rules & Regulations for Indian E Commerce Business. China too has various rules & regulations to keep a check on e retail business. Not only the offline trade but entire India Uninc comprising of Traders, Transporters, SMEs, Truck Operators, Farmers, Hawkers, Cooperative institutions and Consumers will be motivate to join hands together to demand cleaning operation of E Commerce in India. The CAIT has convened a meeting of senior officials of Brand Companies in Mobiles, Consumer Electronics, FMCG, Computers & other segments, on forthcoming 5th November at New Delhi since their respective brand image is also being affected and the long established confidence between Companies & the offline retailers is at stake-said CAIT. We are neither against online retail format of trade nor against any online retailer but the business practices of online retailers are dicey having no Government check, unfair, unhealthy and against all business norms thereby creating an uneven level playing field which is badly affecting the offline trade and that is why we are demanding Rules & Regulations for entire retail spectrum of the Country-said Mr. B.C.Bhartia, CAIT National President. Brick and mortar stores have to pay numerous taxes and undertake large-scale paper work, while e-retailers are registered in one state and making deliveries across the country, causing revenues losses to states, where they are not registered. Under the present structure, the business executed through online retail remains unchecked. No tax authority of any State could firmly say up to what extent the goods are being consumed in their respective State through online retail. Therefore, a check of taxation authorities is more necessary like offline trade. It is most astonishing and surprising that loss making companies are offering huge discounts and yet financers including business tycoons are advancing finances to them on a large scale. It can happen only in India and that too in online retail trade-said CAIT. Certainly, it creates a doubt as to why the financers are more interested in financing entities which are running in losses? Obviously, there could be some hidden reasons-said both Mr. Bhartia & Mr. Khandelwal. Delhi State President of CAIT Mr. Ramesh Khanna said that CAIT seeks constitution of a Special Task Force of taxation experts to examine the compliance of taxation obligations of e-retailers and to study whether there is any tax avoidance. CAIT also wants the Centre to set up a joint committee of senior officials and stakeholders to study the impact of online retail business on offline markets in addition to constituting a Board of Internal Trade for development of business avenues in domestic trade and its empowerment and to upgrade and modernize the existing retail trade. In line with the Budget announcement of the Government, the Union Cabinet gave its approval for amending the existing Foreign Direct Investment (FDI) policy on the ‘Construction Development Sector’. The measures taken by the Union Government are expected to result in enhanced inflows into the Construction Development sector. Given the shortage of land in and around urban agglomerations as well as the high cost of land, the measures are likely to attract investments in new areas and encourage development of plots for serviced housing. The measures are also expected to result in creation of much needed low cost affordable housing in the country and development of smart cities. 1) 100% FDI under automatic route will be permitted in the construction development sector. 1) In case of development of serviced plots, there is no condition of minimum land. 2) In case of construction-development projects, a minimum floor area would be of 20,000 sq. meters. 3) In case of a combination project, any one of the above two conditions will need to be complied with. (b) The investee company will be required to bring minimum FDI of US$ 5 million within six months of commencement of the project. Subsequent inflows of FDI can be brought till the period of ten years from the commencement of the project or before the completion of the project, whichever expires earlier. (c) The investor will be permitted to exit on completion of the project or after three years from the date of final investment, subject to development of trunk infrastructure. (d) The Government may, in view of facts and circumstances of a case, permit repatriation of FDI or transfer of stake by one non-resident investor to another non-­resident investor, before the completion of the project. These proposals will be considered by FIPB on case to case basis. (e) The project shall conform to the norms and standards, including land use requirements and provision of community amenities and common facilities, as laid down in the applicable building control regulations, bye-laws, rules, and other regulations of the State Government/Municipal/Local Body concerned. (f) The Indian investee company will be permitted to sell only developed plots. For the purposes of this policy “developed plots” will mean plots where trunk infrastructure including roads, water supply, street lighting, drainage and sewerage, have been made available. (g) The Indian investee company shall be responsible for obtaining all necessary approvals, including those of the building/layout plans, developing internal and peripheral areas and other infrastructure facilities, payment of development, external development and other charges and complying with all other requirements as prescribed under applicable rules/bye-laws/regulations of the State Government/ Municipal/Local Body concerned. (h) The State Government/ Municipal/ Local Body concerned, which approves the building / development plans, will monitor compliance of the above conditions by the developer. 20 years journey of people’s movements unfolds in Pune! National Alliance of People’s movements – 10th Biennial Convention. 31st October to 2 November. Rashtra Seva Dal, Parvati, Pune. Pune / New Delhi, October 30 : Representatives of people’s movements striving for equality, social justice and sustainable development are meeting in Pune from 31st October to 2nd November to attend the 10th Biennial Convention of NAPM (National Alliance of People’s Movements). These activists have been instrumental in various social struggles and have played a key role in bringing about the important acts like Forest Rights Act for tribal people (2005), revised Land Acquisition and Rehabilitation Act (2013), Hawkers Act (2009), Employment Guarantee Act (2005). Tribal people and farmers fighting for their land rights, urban poor fighting for their right to shelter, groups of people fighting against nuclear energy, communities fighting to save their water-forest-land, experts stressing the need of alternative development model are going to be a part of this three day programme. Senior educationist Anil Sadgopal will inaugurate the convention on 31st October at 10.30 a.m. Noted social activists Medha Patkar will review the 20 years journey of NAPM, and Aruna Roy, Mazdoor Kisan Shakti Sangathan and former member National Advisory Council, will chair this session and reflect on the struggle for accountability and transparency in governance. In a special programme on this occasion, respected senior supporters of people’s movements will be felicitated. A public meeting on ‘Development policy, social justice and India’s future’ will take place at 5.30 p.m. Yogendra Yadav, Pushpa Bhave, Vinoy Vishvam, Dayamani Barla, Khaleel Deshmukh, Shreenivas Khandewale and Vilas Bhongade will be part of this discussion. On 31st October between 2pm to 5pm, group discussions will happen on a range of subjects like agriculture, water, energy, ownership of natural resources, urban planning, alternate development policy, health, education, right to food and others. On 1st November between 9am to 11am, summary of the discussions will be presented. At 6.30 p.m., public meeting on ‘Role of people’s movements in political transformation’ is planned. Ajit Jha, Nikhil Wagle, Lingraj Azad, Dr. Sunilam, Gautam Mody, Anil Chaudhary, will participate in the discussion. Medha Patkar will chair the session. This convention is being viewed with great enthusiasm, as the laws that the new government intends to change, have been developed through these movements. UPA government had considered the voice of People’s Movements to some extent. Senior activist Aruna Roy was even introduced in the National Advisory Committee. BJP government, however, has started questioning the social organisations, people’s movements immediately after taking charge. In this context, how the people’s movements decide their way forward will be an interesting aspect of consideration. In the context of the new developments from the Modi Government plannning to dilute and radically change pro poor laws like the LAAR Act, Labour Laws, Right to Information, MNREGA, Legislation related to Social Security making them anti-poor legislations: various social groups and alliances from across the country have converged today for a Samajvadi Samagam (Socialist Meet) at the SM Joshi Foundation. The purpose of this meeting is to bring together all the like minded socialist groups on to a common platform to fight together the rise of fascism and the present government';s Assault on the lives, livelihoods and natural resources of the common people and vulnerable sections of this country. The coming together of people';s movements is significant at this juncture since, there is outrage at the moment at the way NDA government has been changing environmental laws and wants to change many. The movements are determined to halt any such changes and increase the resistance at the grassroots level against the ongoing assault on the livelihood and natural resources by corporations with help of the government. Thursday, November 13, 5 p.m.
Thursday, November 20, 5 p.m. Please see below for detailed bios of the speakers and for links to RSVP. Dr. Robert Lloyd is the Blanche E. Seaver Professor of International Studies and Languages, professor of international relations, and director of the international studies program at Pepperdine University in Malibu, California. He is also a nonresident senior fellow with the Atlantic Council’s Africa Center in Washington, D.C. and a summer institute fellow with the Schusterman Center for Israel Studies at Brandeis University. Dr. Lloyd received his PhD from Johns Hopkins University’s Paul H. Nitze School of Advanced International Studies in Washington, D.C., his master’s degree from Cornell University, and his bachelor’s degree with honors from the University of Arizona. He has published numerous scholarly articles on international conflict management, international negotiation, democratization, and Africa. Combining his research interests with field experience, Dr. Lloyd has been an election observer in Africa for both the U.S. State Department and the International Republican Institute. He is a member of the editorial board of the Journal of the Middle East and Africa, the flagship journal of the Association for the Study of the Middle East and Africa (ASMEA). Dr. Lloyd’s Fulbright research project examines negotiations on how India has sought to secure political rights and freedoms for its citizens in the face of insecurity posed by terrorism. RSVP here to ensure a seat. Dr. Liza Weinstein is currently a Fullbright-Nehru Fellow in the Sociology Department at the University of Delhi, and is Assistant Professor of Sociology at Northeastern University in Boston. She received her Ph.D. from the University of Chicago in 2009. Her book, The Durable Slum: Dharavi and the Right to Stay Put in Globalizing Mumbai, was recently published by Orient BlackSwan and University of Minnesota Press. Her research on cities and globalization has appaered in a number of journals and several edited volumes. New Delhi, October 30, 2014: Abhinav Bindra, ace shooter and the country’s only individual Olympic Gold medalist, has been elected Chairman of the International Shooting Sport Federation’s (ISSF) Athletes Committee. The ISSF, which is the world body representing the sport of shooting, confirmed this today in a letter, a copy of which was marked to the National Rifle Association of India (NRAI), the representative body of the sport in India. Abhinav, will be the first Indian shooter to be bestowed with this honour. By virtue of being Chairman of the Athletes Committee, Abhinav will also now become a member of the Administrative Council of the ISSF. It can be recalled that Abhinav was re-elected member of the ISSF Athletes Committee in elections held last month in Granada, Spain for a second time. Ontdek wat er te beleven is bij Amsterdam RAI! Bezoek Amsterdam RAI en waan je bij elk evenement in een andere wereld. Laat je verrassen en verrijken door innovatieve producten, kennis, creativiteit en zoveel meer. Ontmoet mensen van ver en van dichtbij. Een bezoek verlegt grenzen, het inspireert! Beleef het zelf tijdens één van onze evenementen dit jaar. Vakevenement Building Holland en CFP organiseren het congres Green Buildings 2014. Centrale vraag: Wat betekent de circulaire economie voor organisaties en gebouwen? Het congres is op 30 oktober in Apeldoorn. Heb jij je al aangemeld voor de Online Huishoudbeurs? Kom jij op 31 oktober t/m 2 november online workshops volgen en lekker shoppen vanaf je eigen bank? We geven veel gratis producten weg en hebben ieder kwartier een superdeal! Meld je gratis aan zodat je verzekerd bent van toegang en gebruik kan maken van de 2=1 actie voor de Huishoudbeurs in februari. Voordelig naar de Negenmaandenbeurs met de 2=1 actie! De Negenmaandenbeurs is de plaats voor (aanstaande) ouders. Wil jij dit jaar de Negenmaandenbeurs voordelig bezoeken? Meld je dan nu aan voor de nieuwsbrief en maak in november gebruik van de voordelige 2=1 actie! Je betaalt slechts € 14,95 voor 2 kaartjes! De Amsterdam RAI E-Newsletter is een publicatie vanAmsterdam RAI, Postbus 77777, 1070 MS te Amsterdam.Meer informatie over de nieuwsbrieven van Amsterdam RAI. Contact opnemen met Amsterdam RAI? Dit e-mailbericht is uitsluitend bestemd voor de geadresseerde en kan vertrouwelijke of persoonlijke informatie bevatten. Indien dit bericht niet voor u bestemd is, wordt u vriendelijk verzocht dit aan de afzender te melden. Alle e-mailberichten van Amsterdam RAI zijn met grote zorgvuldigheid samengesteld. Voor mogelijke onjuistheden en/of onvolledigheid van de hierin verstrekte informatie, noch voor de tijdelijke ontvangst, kan Amsterdam RAI aansprakelijkheid aanvaarden. Evenmin kunnen aan de inhoud van dit bericht rechten worden ontleend. Amsterdam RAI aanvaardt geen enkele aansprakelijkheid voor schade en/of kosten die voortvloeien uit onvolledige en/of foutieve informatie in e-mailberichten. 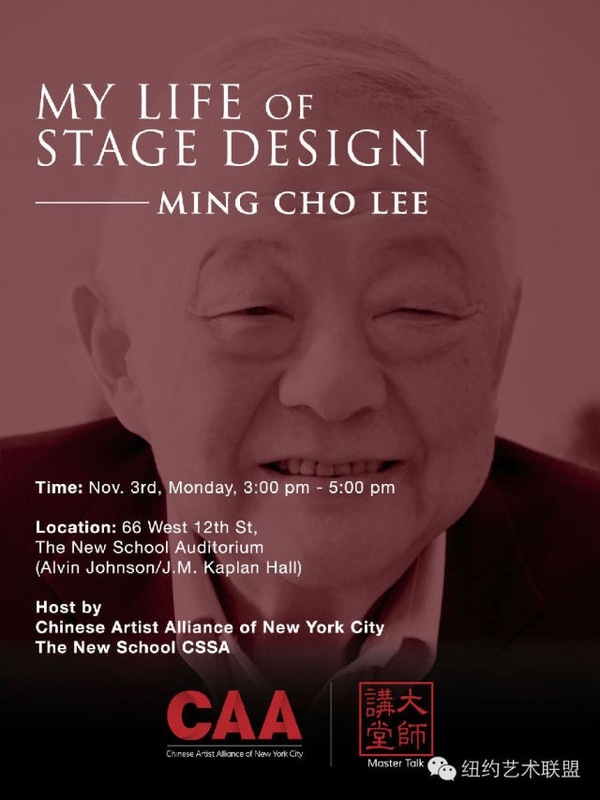 Ming Cho Lee has designed nationally and internationally for 50 years, for opera, dance, Broadway, and regional theatre, and is the recipient of the National Medal of Arts, the highest national award given in the arts. Other awards include the Mayor’s Award for Arts and Culture; Tony Award for Lifetime Achievement, Outer Critic’s Circle and Drama Desk Awards; the TCG Theatre Practitioner Award; many others from the theatre and Chinese communities; and five honorary degrees. Copyright © 2014 The India China Institute, All rights reserved. You are receiving this email because you have been invited to participate in this event by a colleague from the India China Institute. with a unique cake made with the city’s famous snacks ! Everyone knows that the King Khan commands an enormous fan following across the globe and his die-hard fans often do special things for their heartthrob every year on his birthday. This year too, he received a pleasant surprise ahead of his birthday at the recent Indore auditions of Zee TV’s tour in search of India’s happiest dancer – Dil Se Naachein Indiawaale. SRK fans who came to watch the show brought something which was quite unheard of- a gigantic cake made of Indore’s famous snacks (farsan), which became quite the center of attraction for everyone at the auditorium. This three-tier cake was made with a lot of precision that it was difficult to imagine how anyone could have made it at home! It look liked the job of a professional chef to say the least! Along with the audience, Shah Rukh’s fellow judges on the show – Deepika, Boman, Abhishek, Vivaan and Farah surprised him too by doing a special performance on his blockbuster songs. An overwhelmed Shah Rukh was extremely touched by his fans in Indore and thanked them for making his birthday so special. To watch all this masti and more, stay tuned to ‘Maruti Suzuki Alto K 10 Dil Se Naachein Indiawaale Co-powered byAskmebazaar.com & L’Oreal Paris Fall Repair 3X’ every Saturday and Sunday at 9 PM, only on Zee TV. Dr Malcolm Johnson, Director, (Deputy Secretary General – Elect ) International Telecommunication Union,-ITU Geneva( A UN Body) will present the 8th NTA ICT World Communication Awards, 2014 & 8th National Education Awards 2014 at Kolkata on 11th December, 2014 alongwith other VIPs. We request you to plan a visit to Kolkata (West Bengal) on 11th December and please block date for the same. Earlier the Summit & Awards were postponed due to elections in India and Mauritius. National Telecom Awards/ICT World Communication Awards are being organized for last eight years. These are the only ICT recognition platform show in world which are supported by Government & various associations around the globe & presented by Dr. Hamadoun Toure, Secy Gen, ITU during 2012 & 2013.The event will attract all the senior decision makers in the industry around the globe. This is also a unique opportunity to highlight Company’s/ Institutes/ Universities achievements to the assembled dignitaries & wider Telecom & Education community! And also avail the wonderful opportunity to interact and network with dignitaries & wider Telecom & Education community. For any further information you may contact directly – Navtesh, GM-International Trade at navtesh@cmai.asia or Sauravi Dutta, AGM at sauravi@cmai.asia or phone numbers +91 97 118 69771 and +91 83 769 75258 respectively for any further queries. Sharman Joshi (actor) & Shweta Kumar (actress) came to EOD GIP, Noida to address the press conference based on their upcoming Movie “Super Nani”. Rekha is working after a long time in a movie. Rekha is playing a role of Nani (grandmother) in “Super Nani”. “Super Nani” is an Indian drama film directed by Indra Kumar & the producer of the film is Indra Kumar along with Ashok Thakeria. Rekha, Sharman Joshi, Randhi Kapoor, Anupam Kher, Rajesh Kumar & Shweta Kumar are in lead roles in this movie. This film is actually based on the Gujarat play that is ‘Baa Ae Maari Boundary’. ‘Super Nani’ will be released on 31 October 2014. Shweta Kumar (daughter of Indra Kumar) has worked in Karzzzz movie, this was her last movie and upcoming is Super Nani. She also came to address the Press Conference of ‘Super Nani’. Shweta Kumar said “I love working for this movie, Super Nani is my second movie which I did. It was really a great fun working for this movie”. UK Science and Innovation Network in India’s Newsletter. Welcome to the October Edition of the UK Science and Innovation Network in India’s Newsletter. The team is currently preparing for the forthcoming Ministerial Indo-UK Science & Innovation Council, to be held in New Delhi in November. This is the major set-piece event where the priorities and mechanisms for UK-India research and innovation cooperation are agreed every two years. This time, we’re hoping to agree the final shape of the Newton-Bhabha programme, and therefore what funding should soon be available to support more joint research. So watch this space to hear what has been agreed and what new opportunities are coming! Want to keep up to date with all the opportunities funded through the UK’s Newton Fund?Follow this page on gov.uk! For a full list of funding opportunities, please check out our monthly summary. For a full list of upcoming events, please visit here. Renewable energy has been a long term focus of our work developing collaborations between the UK and India – with projects and events across a range of technologies. Just this week, we’ve had a delegation of UK experts on wave and tidal energy visiting India. This follows a similar delegation earlier in the year on offshore wind, and a joint workshop in South Africa on biofuels. Renewable energies have also been the subject for significant joint research funding, including two of the Industrial R&D grants awarded recently. For a full picture of the funded projects, please see RCUK’s summary. And, with the food-water-energy nexus identified as a priority for the Newton Bhabha programme, that support is likely to continue. Let us know if you have ideas for future events that we could help with! Each month, we want to help you understand research and innovation in the UK and India better. Where could you visit, what has happened, what’s been published? Planning a visit to India soon? Check out our top tips for a successful trip. Or check out our map of Indian Science & Innovation to plan your itinerary. We’ve also produced a map of the UK if you’re heading in the other direction! Were you forwarded this email? Subscribe now to get next month’s edition direct! Please find more details of the event enclosed. Please feel free to share the invite with family & friends. In order to make Cologne even better known as a travel destination, we have launched a broad range of activities. One project is the presentation of Cologne’s wonderful range of cultural attractions in the Yearbook of Cultural Brands. This is an outstanding platform for coming into contact with potential sponsorship partners. To advertise our marketing focus for 2014/2015 we produced a video clip on the theme of “Holy Cologne”, one of further videos on central touristic topics of Cologne. New Delhi-based Centre for Civil Society (CCS) has named Luis Miranda, former Chairman of IDFC Private Equity as the Chairman of its Board of Trustees. Luis takes over from Ashish Dhawan, Founder and CEO of Central Square Foundation (CSF) who formerly ran private equity fund, ChrysCapital. Luis founded IDFC Private Equity in 2002 and served as the Chief Executive Officer and President at the firm until 2010. He was earlier a senior member of the start-up team at HDFC Bank. He is Senior Advisor, Morgan Stanley Infrastructure and is involved with various non-profits related to human rights, education and health care. Luis got his MBA from Chicago Booth, where he was influenced by Chicago School economists George Stigler, Gary Becker and Gene Fama. In his new role as Chairman of Board of Trustees of CCS, Luis will provide strategic direction and energize CCS’ initiatives in education, livelihood and policy training as the organisation works toward promoting choice and accountability across private and public sectors. Both Maya n Akhilesh fail to contain riots in UP.